Full text of the article in its original language (French). Hypertype in the canine species has been subject to a lot of thoughts and many publications but the novelty of this work is that it associates two complementary points of view, namely the breeder’s and judge’s and on the other hand the anatomist’s and vet’s. 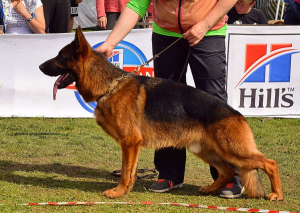 If at shows, the worship of beauty, driven to exaggeration, has taken the step on fitness, one can wonder which tools would be able to avoid these phenomena that are detrimental to the well-being, indeed the soundness of the dogs produced. The standard lever is often put forward; however, one can wonder whether it is not the interpretation of it (or sometimes the lack of meticulous reading) more than the standards themselves which is the cause of these phenomena. 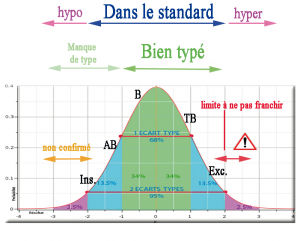 The writing of the current standards, according to the FCI template, should not be able to lead to hypertypes, it is all about valuation and balance from the various players of the dog world. Tools other than standards are clearly available to fight against hypertypes, the authors will only enounce them without developing. Key words: Dogs, hypertype, standards, selection, cynology. (1) Doctor of veterinary medicine, in charge of Unité d’Anatomie Comparée, École Nationale Vétérinaire de Nantes – Oniris, Member of the Standards Commission of Société Centrale Canine, Member of the FCI (Fédération Cynologique Internationale) Standards Commission. (2) Secretary General of the Société Centrale Canine, President of Club Français du Bullmastiff et du Mastiff, chemist. 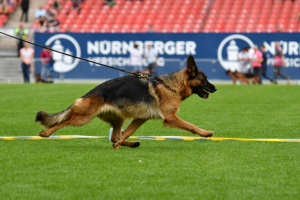 The question devoted to the optimal gate of the modern German Shepherd in running long distances has been widely argued among judges. Over reaching trot is said to be such gait and this point of view is shared by some judges specialised in the breed and criticised by others. The argument in favour of this view is simple: on over reaching trot the length of the German Shepherd step is increased. It means that in order to cover the datum distance the dog has to perform fewer steps and so it gets tired less. We had wondered at this problem and made the research. We would like to share the results of this study accomplished from the Golden section perspective. The Golden section is known to be a universal form building principle of harmony, which gives to corresponding forms the perfection of the structure and the optimal values of the functions that aroused these forms to life. 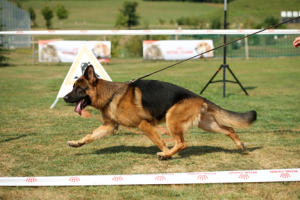 In the frame work of our we consider the German Shepherd of such a structure that would satisfy the aesthetic needs of specialists on the one side, and at the same time the dog would be able to run long distances with minimal energy expenditure. The BMD provides breeders with reference points; the use of these points of reference in breeding gives the possibility of systematic breeding for consolidation the complex of qualities for the well-built dogs, including strong back, deep chest, overall compact, as well as correct articulations and their consistency of actions required for the movement balance in reproducible stock. 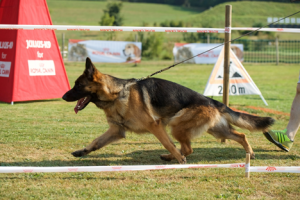 Using BMD in judging allows judges apply the above mentioned reference points to verify their visual impressions; in return, it increases the objectivity of qualification given to the dogs when judging. The back, the loin, and the sacrum form a ratio of “2:1:1”, in which 2 units relate to the back, 1 unit relates to the loin, and the second one relates to the sacrum. This is the most important fundamental principle. It is based on three numbers 1, 1, 2 – the first three figures of the Fibonacci Series. The modification of the Fibonacci Series as it limit is equal to the Golden Section = (√5 -1)/2 ≈3/5. Breaking of this principle leads to disharmony of confоrmation. 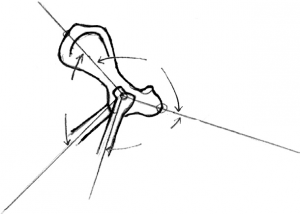 The angle between the middle line of the shoulder blade and the straight line connecting the hip joint (HJ) with the iliac tuber (the angle of the “pendulum”) is equal to 90°. The principle of the right angle of the pendulum provides primary balance of the limbs angulations and creates the preconditions for the equality of the step length of the front limbs (FL) and of the rear limbs (RL), i.e. to the movements balance. The shoulder joint (SJ) and the hip joint (HJ) are on a horizontal line; as well as the elbow joint (EJ) and the knee joint (KJ) are on the other horizontal line. The principle of two horizontals prevents the appearance of a dog which rump is higher than his withers both in standing and in movement. 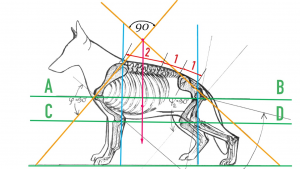 This principle also promotes to the keeping of the horizontal position of the spine in movement, which is important because motive thrusts are transmitted tangentially to the topline, and in this case the dog does not have to “work” on the rise of the gravity centre. The elbow joint of the dog (EJ) is under the withers, and the knee joint (KJ) is placed under the root of the tail (when viewed from the side). The principle of two vertical lines makes it possible to optimise the angles of the SJs and HJs, due to the fact that the slopes and lengths of the humerus and femur have maximum value (from physiological perspective) with such a structure. Equally important that this principle underlies the formation of a movable support in the form of two pairs of joints, which are located exactly under the spinal column endings and mitigate the blows at the moments of jumps and falls. The centre of the dog’s gravity is on the pendulum plumb line omitted from the vertex angle; unilateral limbs converge towards the base of this line in foothold phase. This principle called the convergent powers principle provides the most persistent support of the dog in the given phase of movement. 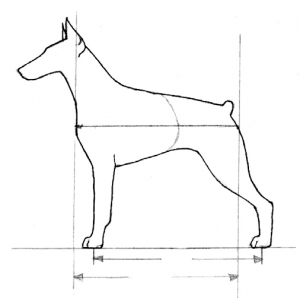 The body length of the dog in correct standing is equal to the distance between its front legs (FL) and rear legs (RL), measured from the side of the hind led placed behind with a vertical rear pastern. 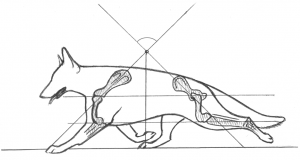 This principle promotes the equality of the FL and RL steps and the movement balance due to the fact that the body of the dog extends forward relatively to the front and rear supports at the same distance. 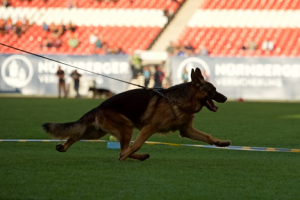 The HMD is the totality of the dog’s proportions, to which the judge’s eye tunes in on evaluation of the overall dog balance. Harmoniousness of the dog depends on the following proportions; the proportions are equal to the Golden Section each. In so doing the dog is evaluated in the correct standing. The chest depth versus the spine length from the withers start to the tail root. The chest length versus the length of the body. The length of the body is measured from the anterior prominence of the sternum to the tuber of the ischium; at the same time the length of the chest is determined as part of the body length ending with the posterior edge of the last rib. Body length versus the length of the diameter of the dog. 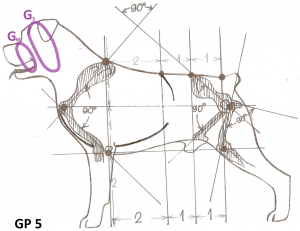 The diameter refers to length of a projection to the vertical plane parallel to the longitudinal axes of the body of a straight line between the occiput and the foot of hind leg placed behind with a vertical rear pastern. The height in the elbow versus the sum of the head and the neck lengths. (###) … As for most breeds, the elbow joint divides the height at the withers in half, then in the proportion GP4, the height at the elbow He can be replaced by the depth of the chest Dch. The girth of the muzzle versus the girth of the skull. The GHN is formed by 4 rows (1) of vertical and 4 rows (2) of horizontal lines placed on the silhouette of a dog in correct standing. through the base of the feet. the 3rd vertical line must pass through the KJ. 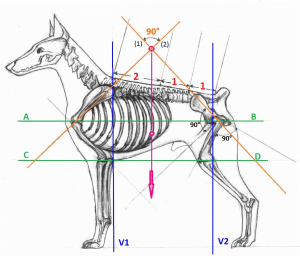 If the elbow joint is on the length equal to the half of height in withers, and the scapula and humerus are of equal length and slope, than the ratio 2:1:1 determines the entire vertical proportions of the dog. Moreover, in accordance with the principle of two horizontals, the 2nd horizontal line passes through the hip joint (HJ), and the 3rd horizontal line passes through the knee joint (KJ). In this case, we may say that the dog outline definitely fits into the GHN, and its build vertically and horizontally is determined by the ratio of 2:1:1.
the proportion values of the producers /parents themselves, corresponding to the GHN, are to be close to the Golden Section. Let us now return to the beginning of the article and ask ourselves, how can we lengthen the steps of the dog and to what extend? At the common sense level, it is obvious that this elongation is facilitated by the body lengthening, which correspond to the more pronounced angulations. They become more open when unbending, that, in its turn, leads to longer steps. Let us consider this in more detail and imagine that in addition to the elongated body the dog has longer top line due to more sloping sacrum while maintaining the entire spinal column ratio of 2:1:1. Pelvis bones become more obliquely, both ilium and ischium. Let us remember that the angle β forming these bones is less than 180°. This follows from obvious considerations. The upper thigh of the hind leg placed behind normally forms the perpendicular to the ischium, and the upper thigh of the hind leg placed under the body forms the perpendicular to the ilium. This ensures the most economical dynamics of the extensor muscles (attached to the ischial bones) and flexor muscles (attached to the iliac bones). 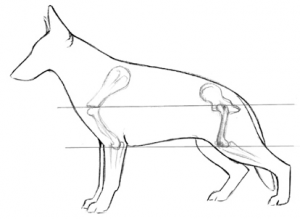 In natural standing one hind leg of the German Shepherd places behind, whereas the other one hind leg places under the body, so that between the upper thighs there is an acute angle α, and since the upper thighs are perpendicular to the corresponding pelvis bones, the angle between the pelvis bones is β = 180°- α, and it is not a flat angle. Note, however, taking to account the right angle of the pendulum, that the increase in the inclination of the iliac bones relative to the horizontal line should not exceed the limit value of 45°, whereas the slope of the shoulder blade versus the horizontal line should not be less than 45°. Otherwise we would have the acute angle of SJ and the dog would have had to expend excessive effort to unbend such a joint. Now let us pay attention to the fact that the depth of the chest at the given lengthening of the topline remains the same, which means that the value of HP1 decreased. Although the absolute lengths of the shoulder blades and upper arms remained the same, their relative lengths (versus the lengthened topline) decreased. In this case, the opening of the SL angle, even if the angle is correct, results in the following: reach forward of the humerus and, accordingly, reach forward of the elbow become insufficient to ensure appropriate length of the FL step in comparison with the extended HL step. Consider the changes occurred on the other part. The ends of the humerus and femur lie on two horizontal lines (the principle of two horizontals retains!). At the same time, now the elongated femur has a slightly more oblique position (otherwise the right angle (90°) of the HJ is impossible), while the humerus, becoming relatively shorter, has to take a more vertical position leading to a more open SJ angle. 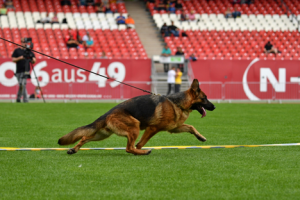 This fact, mentioned in the German Shepherd Dog standard as the tolerance of the blunt SL angle (up to 110°, as in Doberman), as we see, is not without a reason. 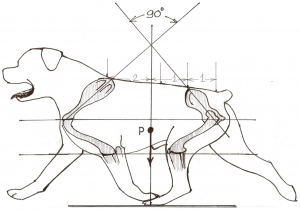 Of course, we should not welcome the deterioration of the SL angle, but now it becomes clear that this deterioration is a consequence of the excessive HJ angle, which results in excessive rear angulations. And the first conclusion* follows from stated above: the rear angulations should not be excessively pronounced, and the step of the RL should not be excessively long. This is the first answer to the question, to what extend can (or need?) 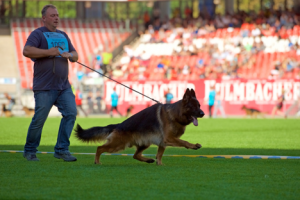 we lengthen the step of the German Shepherd, and to what extend the over reaching trot is considered to be good? If, however, to hold the conclusion made*, the deviation of the SL angle from 90° may be insignificant, while its optimal value, as well as the optimal value of the HJ angle can be achieved due to the principle of two verticals. Let us now return to the question devoted to the adequate length of the FL step and how it may be ensured if the humeroscapular joint opening is not the solution of the issue. The conclusion here can be the only one: it is necessary to extend the forearm, it, in its turn, let increase the value of the high-legged index. The question arises: to what extent? The standard proposes to consider this index in the range of 52-54%. 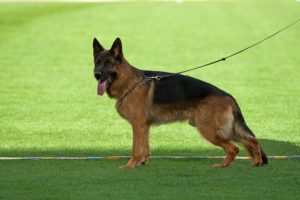 We approached to this question from a practical point of view, on the sample of 11 German Shepherds, to a large extent random; we measured the dogs provided for their compliance with BMD, HMD, and GHN. Fibonacci numbers are highlighted in red. The values of all harmonic proportions, except for HP1 and HP4, remained at the Golden Section level. The value of HP1 decreased to 1/2, and the value of HP4 increased to 2/3. HP1=1/2 means that due to the lengthening of the topline, almost equal to the height at the withers (0.94) the chest depth now being equal to the half of the topline is less than in comparison with the previous value of 3/5. 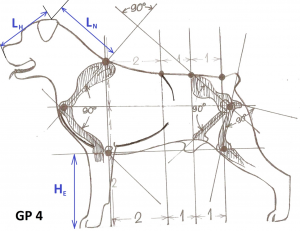 Since the topline is divided by anatomical sections in a ratio of 2:1:1; now Dch=Lth. HP4 = 2/3 means that the sum of the head and the neck lengths is less than before (see HP 4). It means that the head and the neck are now extended forward for a shorter distance than the front leg when the dog makes a step. Now the FL will be forced to hang up in the air* * until the dog’s eye and the FL paw are at the moment of landing on the same vertical line to ensure the equilibrium according to the extended trot criterion. Let us consider the situation that occurs in the case of the new value HP1=1/2. Note that 1/2 is the 2nd member of the Fibonacci Series (and 2/3 is its 3rd member), so the Golden Section still has an impact on the existing transformation. 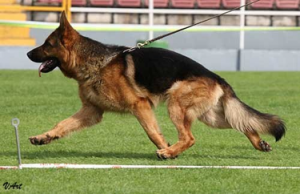 We were faced with the fact that the format elongation in order to lengthen the steps of German Shepherd had led to the fact that the depth of its body decreased, i.e. its chest became relatively less deeper. How is this fact consistent with endurance of German Shepherd that should has a large lungs capacity? Carry out some simple calculations. Let IL=52%; the depth of chest Dch= 48%. Let the height at withers is 4 arbitrary units (a.u. ), depth of chest Dch=1.92 a.u. The back length is 1.92. The chest width is takes as “B”. V≈1.92 x 1.92 x B = 3.686 x B. ( * ) The length of the chest, of course, is greater than the length of the back due to the inclination of the ribs and the prominent prosternum. However, the ribs are shortened toward the abdomen. Therefore, if in the profile instead of the real chest to calculate its capacity, we consider a rectangle whose sides are equal to the length of the back and the depth of the chest, its capacity (the width of the chest remains the same) can be considered approximately equal to the capacity of the real chest. Now, for comparison, consider the case that is fully covered by the GHN, when IL=50%. In this case, Dch=2; Lt=2 x 5/3=3.33; Lth=1.66. which is less than at IL=48%!!! 3. Let us return to the case of greater loftiness. 6. Due to the fact that in normal practice, the height of the elbow is measured at the point of the ulna, and not at the elbow joint, as we do, let us make some additional calculations for the case when IL=51%. With a subsequent increase in IL up to 55%, the capacity of the chest decreases, which indicates further inexpediency of the loftiness. 51-53% – is the height at the elbow joint. 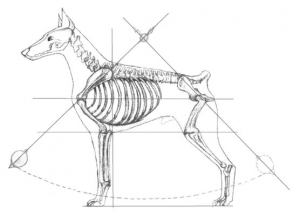 Additional measurements have revealed that at the stage of hang up close to the ground when the dog is trotting at an average speed, its length of the body refers to the length of the limbs span as 3/5, which is not surprising, since the body length and the length of the diameter form the Golden Section. Rather often the creeping trot is believed to be the typical gate for GSH. This is not correct. Movement of creeping trot begins with an advanced step of the fore limb, which takes on a significant part of the dog weight on lending and greatly facilitates the load of the hind limb in the support phase. Not less important that at the time of the forelimb advancing step, the body is located fairly low above the ground. Therefore “a quasi dog” is getting less tired in comparison with other trot gaits as its hind limbs support is significantly reduced and its centre of gravity shouldn’t be lifted high. These phenomena distinguish the creeping trot from all other gaits. Moving with this trot “a quasi dog” leaves only two tracks. 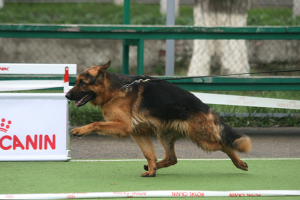 However, in fact, dogs don’t move with this gait; creeping trot is typical movement for wolves. 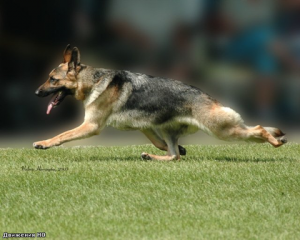 In reality German Shepherds demonstrate swift (accelerated) trot, when the movement starts with the push of the hind limb. At this time, the homonymous front limb is thrown forward and hangs up in the air***. The leg stands on the ground only after the diagonal hind limb has already appeared under the body at the support stage and moved the body forward. With this kind of movement the hind limb at this stage does perform unusual function of support, taking the entire weight of the dog and pushing it forward; such movement gets the dog tired and creates the preconditions for the destruction of HJ***. This gait results in excessive rear angulations, excessive length of RL step in combination with the insufficient SJ angle, and the insufficient length of the FL step. It would seem that an increase of the FL step due to elongation of the forearm is able to equalise the lengths of the steps of the FL and RL and reduce the load on the RL at the stage of support. However, this is not the case: the elongation of the forearm does not affect the head and neck, and their advanced in comparison with the extended reach of the FL becomes even more inadequate. 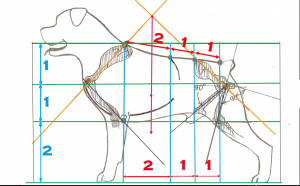 Thus, the hang of the FL will increase and continue until the diagonal RL does move the body forward to a known vertical, which normally should pass through its paw and the dog’s eye (!!!) at the moment of landing. It is quite obvious that now the diagonal RL will have to support the dog’s body even longer at the stage of support and move it further forward. In the limit, the RL ceases to cope with the function of support on the paw and will have to support on the rear pastern! To this we must also add that the opposite FL in this phase will be placed even deeper under the body, which will only increase the overreaching and increase the balance instability. Of course, we can go for one more compensatory step and direct the selection for an increase in the sum of the head and neck lengths S in order to reach the gold section value G4 = He / S and thereby achieve the vertical passage at the moment of landing of the FL through its paw and the dog’s eye after the minimal hanging of the FL. This will reduce the excessive load on the supporting RL. However, one should not forget that G4 = Dch / S (###), and an increase in S under the golden section principle will result in an increase in Dch, i.e. the chest will descend deeper, and the high-score index will decrease, tending to the value of IL = 50%. As a result, we return to the canon typical of most breeds, which prevents extreme manifestations. Worsening of the equilibrium position at the phase of support. Thus, the statement that the overreaching trot is considered to be a productive gait doesn’t stand up to criticism. The target of the breeders is to shorten as much as possible the time of hung up at this stage of movement in order to reduce the load on the rear leg and to minimise the dog energy consumption. 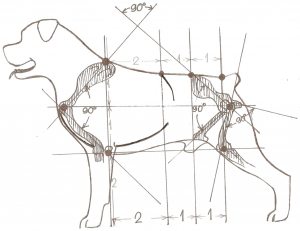 This is possible to fulfill by optimising the angles of the limbs and the length of step at the trot, which is determined by the Golden Section. 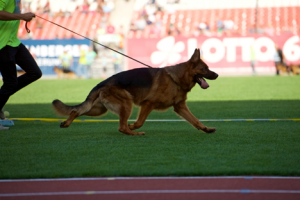 Let us illustrate this situation by means of photos, in which the GSDs move in different trot. In the first photo you see a swift (accelerated) trot without overreaching, with a slight hanging. In this GSD, the ratio of the length of the body to the span of the limbs is B:R = 0.6. In the following photos, the overreaching appears and increases, and the ratio B:R deviates the more towards the decrease of 0.6, i.e. from the golden section, the larger the overreaching becomes. This means that the span of limbs is excessive for the length of the body, which is caused by excessive rear angulations and excessive loftiness. To achieve this goal, we recommend aiming the breeding toward the implementation of the following selection indicators. 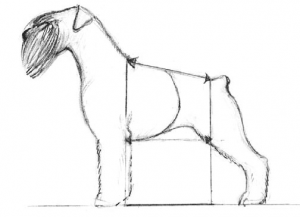 The lengths of the back, loin and sacrum keep the ratio 2:1:1 that determines the harmony of the dog conformation at a basic level. The scapula (shoulder blade) and ilium (both when viewed from the side) form a right angle, at that the scapula is inclined of 45 degrees, which determines the initial balance of the limbs angulations. EJ and KJ are also placed at the same level, which creates the prerequisites for maintaining the horizontal position of the spinal column in movement and prevent the rump from being higher than the withers. EJ is under the withers (when viewed from the side). KJ is under the tail root (when viewed from the side), which allows to optimise the angles of SJ and HJ. Index of loftiness IL is in the range of 51-53%, which allows to increase the endurance of the dog due to the larger chest capacity. Index of format IF is in the range of 115-125% (taking into account measurement mistakes) which contributes to the amplitude of legs movement in trot with the average speed in accordance with the Golden Section. Length of the topline from the withers to the tail root is twice bigger than the depth of the chest. Its length relates to the length of the body as 4/5 and to the height at the withers as not less than 9/10. These ratios serve as points of reference in checking the correctness of conformation. IL=51%, Hw=4, Dch=1,96=Lth; Lt=3,92; Lch=2,94; Lb=4,9; Lt/Hw=0,98; IF=122, V=3,842. As well as these breeds, we could continue adding many others which are not recognised, such as the Australian dingo, the Ethiopian wolf or canis simensis, the cuon alpinus or dhole, the American dingo or Carolina Dog, the Menorcan ca coniller, the Canarian warren hound, the Lampedusa or Tunisian warren hound, the French warren hound, the Galician warren hound and many more. Primitive, (Primitivo, – va from the Latin primitīvus). adj. Something which is the first in its line or has no origin in anything else. adj. Pertaining or relating to the origins or early times of something. of or belonging to the first or beginning; original. adj. earliest of its king, primitive, from primus first. So we may ask ourselves whether we are aware of the origins of the breeds we refer to as “primitive”. Disputing the term “primitive” is an exceedingly complicated business; we could carry out research and write whole texts about it. However, we shall refer to the FCI breed nomenclature, when it uses the term “primitive” to describe breeds of dogs which we know to be of some antiquity, for instance 2000 years or a little more, and which have remained intact until today, such as the spitzes in general, pre-Hispanic dogs, sheepdogs, the Egyptian Pharaoh hounds, etc., simply due to the fact that they have remained geographically isolated for certain periods which we call “ages”. Universities, biologists, palaeontologists and researchers have worked very hard over the last few years to discover the lineage which led to some wolves becoming domestic dogs. The author Javier Salas, a journalist who specialises in scientific, technological and environmental information, offers us a study published in Science on 14/11/2013 for MATERIA, which suggests a third way: i.e. Europe, long before the other possibilities. According to this project, based upon the fullest genetic study of many current canine species and fossils, dogs formed a relationship with hunter-gatherers long before humans began to cultivate the land. 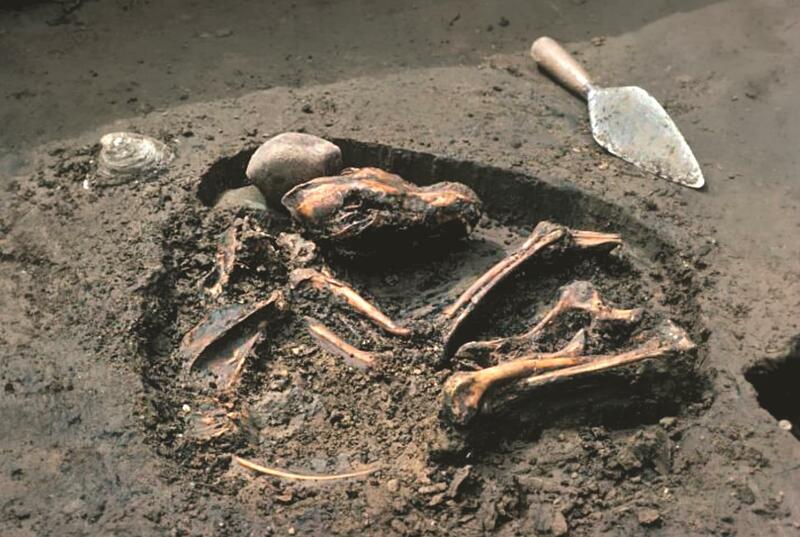 Canine burial dating back 8,500 years found in Illinois (USA). MATERIA. 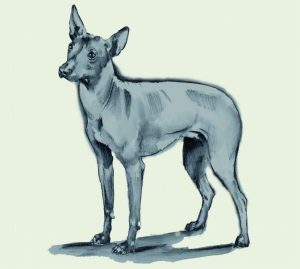 Modern dog breeds contain what we might call a kind of genetic remix, as a result of being cross-bred countless times, which makes it very difficult to trace the path of their evolution. Up until the present, there had been various studies which attempted to draw their family tree by looking for genetic families based on analysing the DNA of hundreds of modern dog breeds. 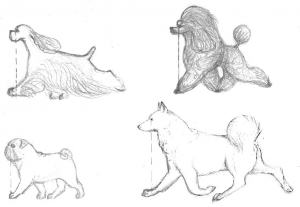 The first of these, in 2002, concluded that the first dogs must have been domesticated somewhere in Asia – in what is now China – around 15,000 years ago. “The dog was the first and only animal to be domesticated before agriculture began”. Subsequently, another study was published in 2010 which included an analysis of 900 dogs and 400 wolves of various different breeds, in an attempt to discover the origins of this domestication. This project claimed that the most likely place of origin was the Middle East, where there are archaeological references to domesticated dogs dating back 12,000 years. ”Dogs appear to share more genetic likeness with Middle Eastern grey wolves than with any other wolf population worldwide”, said the UCLA researcher Robert Wayne, who was responsible for this study, and also pointed out that 80% of dog breeds are modern breeds which have evolved over the last few hundred, although there are some which go back thousands of years. So, China or the Middle East? All these results did not close the door; contemporary DNA could offer a few clues, but was not the ultimate solution. The researchers involved in the search for the first Toby set their sights on studying the DNA of extinct animals, in other words the genetic fossil records of the earliest dogs and extinct wolf breeds held the key to straightening out all this bountiful evolution, and an international group of researchers – including Wayne himself – have dedicated themselves to the task. The mix included not just wolves, modern dogs – from basenji to dingos – and coyotes, but also eighteen fossil samples of ancient canis, from the first dog type fossil, from Belgium and dating back 31,000 years, to ten wolf types from a thousand years ago. Then, returning to the subject of the FCI’s dog breed nomenclature, where we find that, in accordance with what we know and understand at the present time, its morphological classification as “primitive dogs” is not the right term. Perhaps, for the moment, we should refer to them as “intermediate, pre-modern, pre-present-day dogs” etc., and try to find a way of classifying where breeds in the nomenclature which are a few millennia old come in the scheme of things, as distinct from recent breeds which have formed over the last few centuries, until we reach a genuine, conclusive idea of where dog breeds come from – unless someone has a better idea, of course!